It is known that Maxwell's electrodynamics--as usually understood at the present time--when applied to moving bodies, leads to asymmetries which do not appear to be inherent in the phenomena. Take, for example, the reciprocal electrodynamic action of a magnet and a conductor. The observable phenomenon here depends only on the relative motion of the conductor and the magnet, whereas the customary view draws a sharp distinction between the two cases in which either the one or the other of these bodies is in motion. For if the magnet is in motion and the conductor at rest, there arises in the neighbourhood of the magnet an electric field with a certain definite energy, producing a current at the places where parts of the conductor are situated. But if the magnet is stationary and the conductor in motion, no electric field arises in the neighbourhood of the magnet. In the conductor, however, we find an electromotive force, to which in itself there is no corresponding energy, but which gives rise--assuming equality of relative motion in the two cases discussed--to electric currents of the same path and intensity as those produced by the electric forces in the former case. Examples of this sort, together with the unsuccessful attempts to discover any motion of the earth relatively to the "light medium,'' suggest that the phenomena of electrodynamics as well as of mechanics possess no properties corresponding to the idea of absolute rest. They suggest rather that, as has already been shown to the first order of small quantities, the same laws of electrodynamics and optics will be valid for all frames of reference for which the equations of mechanics hold good. We will raise this conjecture (the purport of which will hereafter be called the "Principle of Relativity'') to the status of a postulate, and also introduce another postulate, which is only apparently irreconcilable with the former, namely, that light is always propagated in empty space with a definite velocity which is independent of the state of motion of the emitting body. These two postulates suffice for the attainment of a simple and consistent theory of the electrodynamics of moving bodies based on Maxwell's theory for stationary bodies. The introduction of a "luminiferous ether" will prove to be superfluous inasmuch as the view here to be developed will not require an "absolutely stationary space" provided with special properties, nor assign a velocity-vector to a point of the empty space in which electromagnetic processes take place. The theory to be developed is based--like all electrodynamics--on the kinematics of the rigid body, since the assertions of any such theory have to do with the relationships between rigid bodies (systems of co-ordinates), clocks, and electromagnetic processes. Insufficient consideration of this circumstance lies at the root of the difficulties which the electrodynamics of moving bodies at present encounters. If a material point is at rest relatively to this system of co-ordinates, its position can be defined relatively thereto by the employment of rigid standards of measurement and the methods of Euclidean geometry, and can be expressed in Cartesian co-ordinates. It might appear possible to overcome all the difficulties attending the definition of "time" by substituting "the position of the small hand of my watch" for "time." And in fact such a definition is satisfactory when we are concerned with defining a time exclusively for the place where the watch is located; but it is no longer satisfactory when we have to connect in time series of events occurring at different places, or--what comes to the same thing--to evaluate the times of events occurring at places remote from the watch. We might, of course, content ourselves with time values determined by an observer stationed together with the watch at the origin of the co-ordinates, and co-ordinating the corresponding positions of the hands with light signals, given out by every event to be timed, and reaching him through empty space. But this co-ordination has the disadvantage that it is not independent of the standpoint of the observer with the watch or clock, as we know from experience. We arrive at a much more practical determination along the following line of thought. If at the point A of space there is a clock, an observer at A can determine the time values of events in the immediate proximity of A by finding the positions of the hands which are simultaneous with these events. If there is at the point B of space another clock in all respects resembling the one at A, it is possible for an observer at B to determine the time values of events in the immediate neighbourhood of B. But it is not possible without further assumption to compare, in respect of time, an event at A with an event at B. We have so far defined only an "A time" and a "B time." We have not defined a common "time" for A and B, for the latter cannot be defined at all unless we establish by definition that the "time" required by light to travel from A to B equals the "time" it requires to travel from B to A. Let a ray of light start at the "A time" from A towards B, let it at the "B time" be reflected at B in the direction of A, and arrive again at A at the "A time'' . 1. If the clock at B synchronizes with the clock at A, the clock at A synchronizes with the clock at B. 2. If the clock at A synchronizes with the clock at B and also with the clock at C, the clocks at B and C also synchronize with each other. Thus with the help of certain imaginary physical experiments we have settled what is to be understood by synchronous stationary clocks located at different places, and have evidently obtained a definition of "simultaneous," or "synchronous," and of "time." The "time" of an event is that which is given simultaneously with the event by a stationary clock located at the place of the event, this clock being synchronous, and indeed synchronous for all time determinations, with a specified stationary clock. to be a universal constant--the velocity of light in empty space. 1. The laws by which the states of physical systems undergo change are not affected, whether these changes of state be referred to the one or the other of two systems of co-ordinates in uniform translatory motion. where time interval is to be taken in the sense of the definition in § 1. (a) The observer moves together with the given measuring-rod and the rod to be measured, and measures the length of the rod directly by superposing the measuring-rod, in just the same way as if all three were at rest. In accordance with the principle of relativity the length to be discovered by the operation (a)--we will call it "the length of the rod in the moving system''--must be equal to the length of the stationary rod. The length to be discovered by the operation (b) we will call "the length of the (moving) rod in the stationary system." This we shall determine on the basis of our two principles, and we shall find that it differs from . Current kinematics tacitly assumes that the lengths determined by these two operations are precisely equal, or in other words, that a moving rigid body at the epoch may in geometrical respects be perfectly represented by the same body at rest in a definite position. where denotes the length of the moving rod--measured in the stationary system. Observers moving with the moving rod would thus find that the two clocks were not synchronous, while observers in the stationary system would declare the clocks to be synchronous. Let us in "stationary" space take two systems of co-ordinates, i.e. two systems, each of three rigid material lines, perpendicular to one another, and issuing from a point. Let the axes of X of the two systems coincide, and their axes of Y and Z respectively be parallel. Let each system be provided with a rigid measuring-rod and a number of clocks, and let the two measuring-rods, and likewise all the clocks of the two systems, be in all respects alike. Now to the origin of one of the two systems ( ) let a constant velocity be imparted in the direction of the increasing of the other stationary system (K), and let this velocity be communicated to the axes of the co-ordinates, the relevant measuring-rod, and the clocks. To any time of the stationary system K there then will correspond a definite position of the axes of the moving system, and from reasons of symmetry we are entitled to assume that the motion of may be such that the axes of the moving system are at the time (this " " always denotes a time of the stationary system) parallel to the axes of the stationary system. We now imagine space to be measured from the stationary system K by means of the stationary measuring-rod, and also from the moving system by means of the measuring-rod moving with it; and that we thus obtain the co-ordinates , , , and , , respectively. Further, let the time of the stationary system be determined for all points thereof at which there are clocks by means of light signals in the manner indicated in § 1; similarly let the time of the moving system be determined for all points of the moving system at which there are clocks at rest relatively to that system by applying the method, given in § 1, of light signals between the points at which the latter clocks are located. To any system of values , , , , which completely defines the place and time of an event in the stationary system, there belongs a system of values , , , determining that event relatively to the system , and our task is now to find the system of equations connecting these quantities. In the first place it is clear that the equations must be linear on account of the properties of homogeneity which we attribute to space and time. If we place , it is clear that a point at rest in the system must have a system of values , , , independent of time. We first define as a function of , , , and . To do this we have to express in equations that is nothing else than the summary of the data of clocks at rest in system , which have been synchronized according to the rule given in § 1. It is to be noted that instead of the origin of the co-ordinates we might have chosen any other point for the point of origin of the ray, and the equation just obtained is therefore valid for all values of , , . where is a function at present unknown, and where for brevity it is assumed that at the origin of , , when . and is an as yet unknown function of . If no assumption whatever be made as to the initial position of the moving system and as to the zero point of , an additive constant is to be placed on the right side of each of these equations. We now have to prove that any ray of light, measured in the moving system, is propagated with the velocity , if, as we have assumed, this is the case in the stationary system; for we have not as yet furnished the proof that the principle of the constancy of the velocity of light is compatible with the principle of relativity. The wave under consideration is therefore no less a spherical wave with velocity of propagation when viewed in the moving system. This shows that our two fundamental principles are compatible. In the equations of transformation which have been developed there enters an unknown function of , which we will now determine. Thus, whereas the Y and Z dimensions of the sphere (and therefore of every rigid body of no matter what form) do not appear modified by the motion, the X dimension appears shortened in the ratio , i.e. the greater the value of , the greater the shortening. For all moving objects--viewed from the "stationary" system--shrivel up into plane figures.For velocities greater than that of light our deliberations become meaningless; we shall, however, find in what follows, that the velocity of light in our theory plays the part, physically, of an infinitely great velocity. It is clear that the same results hold good of bodies at rest in the "stationary" system, viewed from a system in uniform motion. Further, we imagine one of the clocks which are qualified to mark the time when at rest relatively to the stationary system, and the time when at rest relatively to the moving system, to be located at the origin of the co-ordinates of , and so adjusted that it marks the time . What is the rate of this clock, when viewed from the stationary system? whence it follows that the time marked by the clock (viewed in the stationary system) is slow by seconds per second, or--neglecting magnitudes of fourth and higher order--by . From this there ensues the following peculiar consequence. If at the points A and B of K there are stationary clocks which, viewed in the stationary system, are synchronous; and if the clock at A is moved with the velocity along the line AB to B, then on its arrival at B the two clocks no longer synchronize, but the clock moved from A to B lags behind the other which has remained at B by (up to magnitudes of fourth and higher order), being the time occupied in the journey from A to B. It is at once apparent that this result still holds good if the clock moves from A to B in any polygonal line, and also when the points A and B coincide. If we assume that the result proved for a polygonal line is also valid for a continuously curved line, we arrive at this result: If one of two synchronous clocks at A is moved in a closed curve with constant velocity until it returns to A, the journey lasting seconds, then by the clock which has remained at rest the travelled clock on its arrival at A will be second slow. Thence we conclude that a balance-clock7 at the equator must go more slowly, by a very small amount, than a precisely similar clock situated at one of the poles under otherwise identical conditions. from which we see that such parallel transformations--necessarily--form a group. We have now deduced the requisite laws of the theory of kinematics corresponding to our two principles, and we proceed to show their application to electrodynamics. where (X, Y, Z) denotes the vector of the electric force, and (L, M, N) that of the magnetic force. The analogy holds with "magnetomotive forces." We see that electromotive force plays in the developed theory merely the part of an auxiliary concept, which owes its introduction to the circumstance that electric and magnetic forces do not exist independently of the state of motion of the system of co-ordinates. Furthermore it is clear that the asymmetry mentioned in the introduction as arising when we consider the currents produced by the relative motion of a magnet and a conductor, now disappears. Moreover, questions as to the "seat" of electrodynamic electromotive forces (unipolar machines) now have no point. Here ( , , ) and ( , , ) are the vectors defining the amplitude of the wave-train, and the direction-cosines of the wave-normals. We wish to know the constitution of these waves, when they are examined by an observer at rest in the moving system . We see that, in contrast with the customary view, when . It follows from these results that to an observer approaching a source of light with the velocity , this source of light must appear of infinite intensity. We may therefore say that this surface permanently encloses the same light complex. We inquire as to the quantity of energy enclosed by this surface, viewed in system , that is, as to the energy of the light complex relatively to the system . It is remarkable that the energy and the frequency of a light complex vary with the state of motion of the observer in accordance with the same law. Now let the co-ordinate plane be a perfectly reflecting surface, at which the plane waves considered in § 7 are reflected. We seek for the pressure of light exerted on the reflecting surface, and for the direction, frequency, and intensity of the light after reflexion. All problems in the optics of moving bodies can be solved by the method here employed. What is essential is, that the electric and magnetic force of the light which is influenced by a moving body, be transformed into a system of co-ordinates at rest relatively to the body. By this means all problems in the optics of moving bodies will be reduced to a series of problems in the optics of stationary bodies. denotes times the density of electricity, and the velocity-vector of the charge. If we imagine the electric charges to be invariably coupled to small rigid bodies (ions, electrons), these equations are the electromagnetic basis of the Lorentzian electrodynamics and optics of moving bodies. Since--as follows from the theorem of addition of velocities (§ 5)--the vector is nothing else than the velocity of the electric charge, measured in the system , we have the proof that, on the basis of our kinematical principles, the electrodynamic foundation of Lorentz's theory of the electrodynamics of moving bodies is in agreement with the principle of relativity. In addition I may briefly remark that the following important law may easily be deduced from the developed equations: If an electrically charged body is in motion anywhere in space without altering its charge when regarded from a system of co-ordinates moving with the body, its charge also remains--when regarded from the "stationary'' system K--constant. where denote the co-ordinates of the electron, and the mass of the electron, as long as its motion is slow. Now, secondly, let the velocity of the electron at a given epoch be . We seek the law of motion of the electron in the immediately ensuing instants of time. Without affecting the general character of our considerations, we may and will assume that the electron, at the moment when we give it our attention, is at the origin of the co-ordinates, and moves with the velocity along the axis of X of the system K. It is then clear that at the given moment the electron is at rest relatively to a system of co-ordinates which is in parallel motion with velocity along the axis of X. With a different definition of force and acceleration we should naturally obtain other values for the masses. This shows us that in comparing different theories of the motion of the electron we must proceed very cautiously. We remark that these results as to the mass are also valid for ponderable material points, because a ponderable material point can be made into an electron (in our sense of the word) by the addition of an electric charge, no matter how small. Thus, when , W becomes infinite. Velocities greater than that of light have--as in our previous results--no possibility of existence. This expression for the kinetic energy must also, by virtue of the argument stated above, apply to ponderable masses as well. We will now enumerate the properties of the motion of the electron which result from the system of equations (A), and are accessible to experiment. This relationship may be tested experimentally, since the velocity of the electron can be directly measured, e.g. by means of rapidly oscillating electric and magnetic fields. These three relationships are a complete expression for the laws according to which, by the theory here advanced, the electron must move. In conclusion I wish to say that in working at the problem here dealt with I have had the loyal assistance of my friend and colleague M. Besso, and that I am indebted to him for several valuable suggestions. This edition of Einstein's On the Electrodynamics of Moving Bodies is based on the English translation of his original 1905 German-language paper (published as Zur Elektrodynamik bewegter Körper, in Annalen der Physik. 17:891, 1905) which appeared in the book The Principle of Relativity, published in 1923 by Methuen and Company, Ltd. of London. Most of the papers in that collection are English translations from the German Das Relativatsprinzip, 4th ed., published by in 1922 by Tuebner. All of these sources are now in the public domain; this document, derived from them, remains in the public domain and may be reproduced in any manner or medium without permission, restriction, attribution, or compensation. Numbered footnotes are as they appeared in the 1923 edition; editor's notes are marked by a dagger ( ) and appear in sans serif type. The 1923 English translation modified the notation used in Einstein's 1905 paper to conform to that in use by the 1920's; for example, denotes the speed of light, as opposed the used by Einstein in 1905. The preceding memoir by Lorentz was not at this time known to the author. i.e. to the first approximation. We shall not here discuss the inexactitude which lurks in the concept of simultaneity of two events at approximately the same place, which can only be removed by an abstraction. 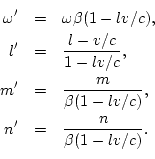 The equations of the Lorentz transformation may be more simply deduced directly from the condition that in virtue of those equations the relation shall have as its consequence the second relation . That is, a body possessing spherical form when examined at rest. Editor's note: In the original 1923 English edition, this phrase was erroneously translated as "plain figures''. I have used the correct "plane figures" in this edition. Not a pendulum-clock, which is physically a system to which the Earth belongs. This case had to be excluded. If, for example, X=Y=Z=L=M=0, and N 0, then from reasons of symmetry it is clear that when changes sign without changing its numerical value, must also change sign without changing its numerical value. The definition of force here given is not advantageous, as was first shown by M. Planck. It is more to the point to define force in such a way that the laws of momentum and energy assume the simplest form.